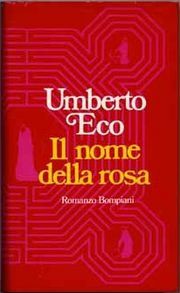 The Library central to Umberto Eco’s book is known as The Secretum. It is apparently the largest library of the Christian world and inaccessible to all but the librarian and the librarian’s assistant. 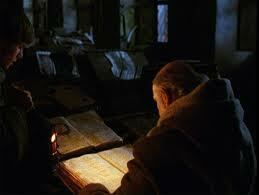 The Library is located on the third floor of the Aedificium the focal point of the monastery in which the book is set. 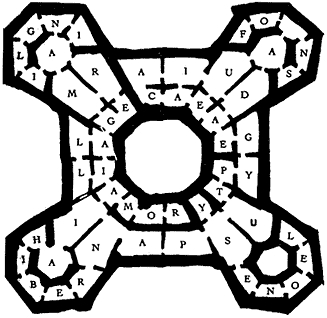 It is built celestially above the ossarium, filled with the bones of monks, the inferno of the kitchen/refectory, and the scriptorium, a ‘paradise on earth,’ where monks from all over the earth congregate to study the manuscripts. It is described as a speculum mundi or ‘mirror of [that] world.’ The age and height of the Aedificium provide a graphic image of mankind’s place in the universe, of the punishments and rewards in the hereafter. Malachi of Hildesheim—tall and extremely thin with large and awkward limbs cloaked in the black habit of the order. 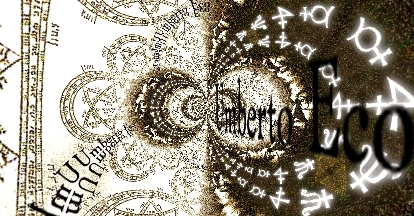 He is described as a sad and severe character whose eyes can penetrate a person’s secret thoughts. His assistant the young and rather feminine Berengar of Arundel is in love with Adelmo the illustrator and seems to have been a victim even before he becomes one in the book . The plan of Eco’s labyrinthine library derives from a large thirteenth-century maze once existing on the floor of Rheims Cathedral in France. The library itself is ordered like a world map. However, to find a book it is necessary to crack a series of codes: ‘iii, IV gradus, V in prima graecorum’ suggest that particular book is ‘third on the fourth shelf in the fifth case’ of a corridor or room referred to as ‘the first of the Greeks.’ Furthermore, there is a formula to finding books based on the 24 letter latin alphabet making reference to quotations from the Apocolypse from the book of Revelations. A library labyrinth that forms the centre of intrigue in this detective history novel. This entry was posted in Uncategorized on 19 July 2013 by alibilibrary.